Did you watch farmer Chris and his search for love? Were you super excited each week to find out what happened next? Did you find yourself dreaming about what it will be like the day you get proposed too? In the aftermath of that final rose, it got me thinking about my dating days and all of you single girls/women in search of Mr. Right. I was in your shoes once. And as I walked the path of dating – discovering and losing love, I learned a few important things along the way that I would like to pass along and share with you. Before we start, I think it goes without saying that dating one boy at a time is just the best way to go. Unlike “The Bachelor or Bachelorette”, where dating multiple people at once is part of the process, sticking to one boy at a time will allow you to focus and put your heart into that one person to find out if he is the one for you. In the end, it will cause much less confusion and stress. Besides, your reputation depends on it! 1. Treat each boy you date with the upmost respect. Growing up, showing respect was one of the top things my father wanted to teach us kids, and to this day, I think it is one of the top things I try to teach my boys as well. Respect is so important and I literally cringe when I see disrespect being shown around me. Take notice of the qualities and abilities of the boy you are dating and let him know that you admire those things. Be considerate, encourage him, and treat him in a proper way. I don’t know a man on earth who wouldn’t want that. BUT just as important, if the boy you are dating doesn’t show respect in return – end the relationship. Seriously. You are worth so much more than to be treated with disrespect. 2. If you love him, let him go. Girls, this one is tough and heartbreaking, but so important. If at any point during your relationship you can tell that something isn’t quite right, or that your boyfriend is trying to get out – even if you love him you need to let him go. If you sense this, then you need to love him enough so he can be free to find the one who is meant for him. In the end if you are meant for each other, then eventually he will return and it will all work out! I’ll give you one example. One time while I was dating, during a particular weekend, my boyfriend ended up being very unhappy with me. In fact he told me, “I thought you were somebody special, but I guess you are just like every other girl out there.” Yeah, that hurt. However, instead of begging him to stay and trying to prove to him that I really was someone special, I quietly let him walk out and leave. I knew he needed to figure out on his own if he thought I was worth returning to or not. And there was no way that I was going to sit and beg for him to come back. I needed and wanted him to decide ON HIS OWN. I honestly didn’t know what he would decide and the thought of having my heart broken again about did me in. However, after spending the weekend alone thinking things through, he came back to me and decided I was worth it enough to continue dating. I was glad he did. 3. If the relationship is coming to an end, make sure you end it as graciously as possible. I’m not saying that you can’t cry, but whatever you do; try your very best to not make a big dramatic scene! Truly listen to what he has to say as it might help you learn for the next relationship. Whether it is you who is breaking it off or the boy, always take a moment to thank him for the time and money that he invested into you. My father gave me this advice in my early years of dating and I tried very hard to stick to it. He told me to try to hold it together as much as I could during the moment, and then when I was on my own, I could cry as much as I needed too. 🙂 I can tell you that more than once, when a boy was breaking up with me and I used this tact, it was actually the boy who ended up crying instead of me! It will make him think twice if he is doing the right thing or not. Other times, you might find that you both are crying but you know that ending things is what needs to happen. It hurts. But even so, being gracious will allow the relationship to end on a respectful note. 4. Make a list of things you absolutely cannot compromise with and stick to that. Most likely you will end up dating guys of all kinds. Which is great because it will allow you to see what you find most attractive and what kind of qualities you really desire in someone. If you take some time to think about it and know the things that are most important to you and that you cannot compromise on, it will be your guide as you are searching for that special someone. (Some examples include things like your religious beliefs and practices, if you want to have kids or not, how they treat you in public and private, etc.) If you find that the boy you are dating does not match those things on your “absolutely cannot compromise list”, then you need to let him go. It will save you much pain and stress in the future. 5. Be honest, real, and true to yourself! Just be the best YOU that you can be. Don’t turn into someone else just for the sake of trying to be with a certain boy. That will never last. If the boy doesn’t enjoy you or love you for who you are, then there is someone else that will. God made you just the way you are for a reason, so embrace that! You have just the right qualities that someone is looking for. I have to say that I really enjoyed my dating years and am grateful for each and every experience. I’m not going to lie; it can be a wild ride! It will bring you some major highs but it will also bring you some major lows. After all, it is either going to work out or it isn’t. But that is all part of the process, and with each ended relationship, you can learn from it which can benefit the next one that comes along. I also just want to say that if you watch “The Bachelor/Bachelorette”, do you notice that most often, the final two people left to choose from are so very different from each other and yet, the Bachelor/Bachelorette are “falling in love” with them both? I had a counselor who told me once, “Rachel, I think you could fall in love and marry several different types of boys and end up living a very happy life.” What he was trying to say is that instead of worrying so much about finding that one soul mate person, trying to find a “perfect” match, what you need to focus on is finding that one person who you just can’t live without. The one person who respects you the greatest, loves you for who you are the most, and selflessly focuses on encouraging you to develop the gifts that God has given you. Sometimes, you might end up thinking you found him- the one you can’t live without, but unfortunately, he might be thinking otherwise. I want you to remember a couple things my dad told me in those situations: (1) “Rach, if he leaves, it is his loss” and (2) “Just think how much you loved him, but the boy that is meant for you, you will love even more!” Good advice, right? 🙂 At least I appreciated him trying to make me feel better. Every once and a while, there are those people who only date that one person and know he is the one. I personally know of a few amazing people who only ever dated their spouse. If that is you – wonderful! What a great story to tell! But girls, we live in a broken world and it hurts sometimes. Boys will disappoint and they might walk away. You can’t control what they say or how they act. You can however control yourself, but the truth is, we all make mistakes. You too, will end up doing things that disappoint him. Just like the popular song says – God can indeed bless the broken road. Not only myself, but I have a few best friends who can testify to that as well. All this advice is just that – advice. You are free to take it or leave it. However, I want you to remember that you are worthy of love! 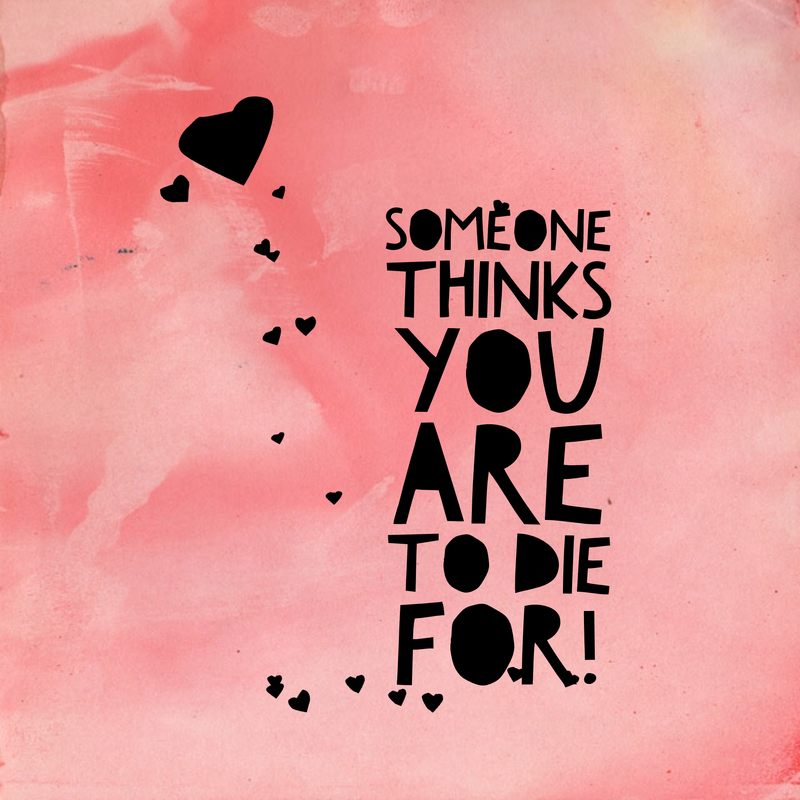 You may not be “perfect”, but there is someone out there who thinks you are to die for, and his name is Jesus. No other human being can love us like Him. If you try to find that kind of love in someone else, you will be disappointed every single time. Our human love requires a lot patience, forgiveness, grace, and perseverance. When that kind of love is both given and received, it will blossom and flourish! In the meantime, have fun! Put your seatbelt on and enjoy the wild ride! The highs are worth the lows, and the memories made can never be taken away. Then one day, Lord willing, you might just find yourself at the end of an aisle, looking directly into your husbands eyes, and you will realize that it was all worth it!